� Which area in which to buy and why. � How to make your property appealing to sellers - tips that work. � Market commentary - recession seems to be over, is it now the time to buy? � What role does interest on your bond play? A secure lifestyle in Centurion awaits you! Townhouses, houses & 24/7 security estates. On 46 Rentals available from only R 4 200 per month! Herewith the current Centurion and Midrand townhouse availability lists in price order. The property for sale list will follow the rental list and a list of property professionals thereafter. All property professionals also accept and respond to WhatsApp messages. ★ Rentals available ★(View all rentals online with pictures in price order from low to high) Click here to apply to rent. ★ Rental management ★ Do you own a property and need a tenant?Tenants with stable income and good credit scores waiting for the right property to rent.Queries received for immediate availability, 1 December, 1 January and 1 February already on a waiting list.Debit order rental collection.Inspections.Maintenance.Contact 0126615144 or WhatsApp 0829059800. Brand new properties, no transfer fees payable & 100% bonds available! 4. Newly built 2 bedroom simplex townhouses in Summerfield Estate in Kosmosdal.2 Bedrooms 1 Bathroom and 1 Garage with a floor area of 40 m�.Levy R 400.Beautiful new development in Summerfield Estate Kosmosdal X 86, full title houses, with all the cost included. The simplexes are ranging from 2 to 3 bedrooms and 1 to 2 bathrooms with a Garage and space for your beautiful garden . Price range from R749 000 to R1 250 000.00.24/7 strict security control. This beauty is next to shopping centers and schools. Easy access to major routes N1 and R28. Call/WhatsApp Kenneth 0624613831 to view. List of property professionals in Centurion and Midrand that can help you sell or rent. Clients may currently be looking for a property just like yours right now. Please call, sms or WhatsApp. If property interests you, you may consider becoming a property agent part time or full time and assist in the buying, selling and rental of property, please contact our call centre on 0126615144 and supply us with copy of your CV.We welcome experienced and new agents and provide relevant training to ensure candidates get up and running in no time. Centurion's and Midrand's leading property experts. The ★ Buy ★Sell ★ Rent ★ specialists! A strong focus on safe and secure townhouses and houses in various security estates in Centurion. Properties for sale between R450000 and R6 million, and rentals R4000 to R25000 per month available. 22. R850000. Kenneth 0624613831. 2 Bedroom simplex in Seoul townhouse complex, Mulder Street, The Reeds. 2 Beds 1 Baths 1 Garage. This beautiful townhouse is in a quiet estate with only a few houses. Strict 24/7 security at Seoul complex. Not far from schools and shopping centers. Easy access to major routes N1 and R28. This is a give away price,come and view this beautiful property today! ★ New developments for sale ★ Brand new properties, no transfer fees payable & 100% bonds available! If property interests you, you may consider becoming a property agent part time or full time and assist in the buying, selling and rental of property. Please contact our Call Centre on 0126615144 and supply us with copy of your CV. We welcome experienced and new agents and provide relevant training to ensure candidates get up and running in no time. We place a strong focus on safe and secure properties in various security estates. Properties for sale between R500000 and R6million and rentals between R6000 and R20000 per month always available. Our specialty is Centurion townhouses and houses. Visit our office at 17 Eco Boulevard Centre, Witch Hazel Ave, Eco Park, Highveld, Centurion, to learn more about our exciting initiatives, fabulous properties or to meet one of our agents. 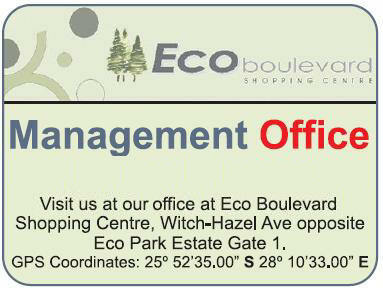 Our office number is 012 661 5144. We look forward to seeing you soon! By subscribing to our newsletter, you'll be the first to know when a new property is placed on the market. Find out before other buyers! Some of the Townhouse complexes we cover are listed below. Should your property be in one of these sectional title complexes, you can be sure we have an agent that can assist you with details on the reasonable market value and advice on selling price. "Trudey, persoonlik wil ek net vir jou baie, baie dankie s� - jy was `n absolute BRILJANTE agent op wie ek ALTYD kon staat maak op die rare tye wanneer die pawpaw die fan ge-strike het, en dit was `n absolute plesier om met jou te werk. Jy is `n massiewe aanwins en jou gewig in GOUD werd vir jou agentskap." "Net om baie dankie te se vir die IT3(b)'s -dit is darem `n plesier om met sulke mense te werk wat inligting wat aangevra word duidelik en akkuraat deur gegee word." "Vreeslik dankie vir die uitstekende diens. Ek het jou epos aan my sus gestuur, want dit is ons twee wat daar sal woon. Ek waardeer regtig jou professionalisme en sal graag vir jou op �n latere stadium ons gegewens wil deur stuur om ons behoefte bepaling te kan doen." "'n Agent wat ek vertrou en met wie ek voorstel jy skakel in die verband is Johan Hattingh. Ek het hom sommer gekopieer op die e-pos." "I come to you for advice as I am happy with the service I get from your company for the rental management of my property." "I got your info from a very happy buyer and she�s put me in contact with you." "Thank you for everything. Thank you for your patience and all your HR skills, you have been absolutely amazing. You deserve an award. Expect a gift from me soon. Your help is infinitely appreciated." "Mariana ek wil net dankie vir jou en vir tannie Julia se vir al die hulp en dinge met my suster se woonstel. Waardeer dit baie, Julia is 'n regte yster..."
"You have been of amazing help and it is very much appreciated." "Dankie J Julle diens is regtig wonderlik." "I wish to express my sincere appreciation for affording me the opportunity to find a property with Centurion Real Estate at MAPLE Eco Park, Centurion. I never had any hassles, I will recommend your company to anyone." "Plesier om met jou besigheid te doen." "Frans het my na jou verwys. Ek verstaan julle hanteer 'n klompie verhuurings vir hom en hy kan nie uitgepraat raak oor julle goeie diens nie." "I was at your office in Eco Park earlier this week and would like to complement you on what seems to be a well run and beautiful establishment!" "Baie dankie vir julle vinnige reaksie." "Weereens baie dankie dat julle ons verhuuring so maklik maak!" "I wish to express my sincere appreciation for affording me the opportunity to rent with Centurion Real Estate at MAPLE Eco Park, Centurion. I never had any hassles, I will recommend your company to any one that needs a rental service either as an owner or a tenant." "Baie dankie vir julle uitstekende diens, ek wens ons paaie het lank tevore gekruis. Ek is bly die huurder is nou happy en dinge kan aanbeweeg." "Dankie dat jy altyd so vinnig help!" "I would just like to commend Mariana for her excellent service. She is an absolute star and her service is extremely effective and prompt. We never had any problems with her and whenever we asked anything of any nature, she responded with value added services. I just wanted to inform you and please thank her for me and if you do have a recognition program or prize giving, I trust that Mariana will surely be the one to take it!" "Jinne, dis so lekker om saam met julle te kan werk � dit maak my lewe so maklik!" "I am happy with your quality of service and regular deposits on time every month. Very professional. Thank you." "It would be unjust not to compliment you on two things. Firstly, you are the first agents from many (and I truly mean MANY) showing true professionalism. It has been a wholly horrendous experience trying to deal with some of these rental agencies. Secondly, the fact that contrary to the status quo out there, you keep your site's listings thoroughly updated - it has been a real help." 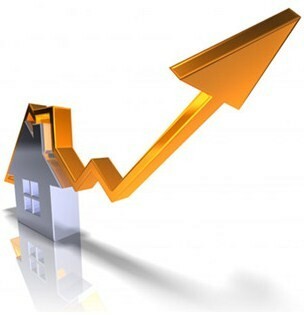 Benefit from buying or selling your home through Centurion Real Estate in Centurion. We can sell or rent your property! Properties for sale R450000 to R6 million. Rentals R4000 to R25000 per month.